1) Duct Tape - 50 yard roll. (1) Tarp - 10’ x 12’ reinforced rip stop polyethylene. (1) Survival Candle - 3 separate wicks; provides 36 hours of light. (1) Box of Waterproof Matches - 50 waterproof matches. (1) Axe - flattened head for hammering. (3) Document Storage Bags - waterproof, zip-lock bags. (1) Safety Goggles - adjustable strap. (1) Folding Shovel - tri-fold in pouch. (1) Survive-a-Hurricane Guide - hurricane survival guide. Hurricane accessory kit with emergency supplies specifically designed to prepare your home and family for a hurricane. 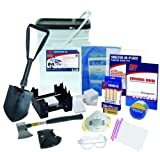 Contains duct tape, polyethelene tarp, survival candle, waterproof matches, axe, document storage bags, safety goggles, folding shovel, and a hurricane survival guide. Packaged in Flip-Top waterproof container.